Co-founder Dan Tordjman speaks at the announcement of the initial Equestricon. Photo by Steve Crayne. Festivities celebrating the Breeders’ Cup World Championships at Churchill Downs will start early this year. Tickets are now on sale for a week-long fan experience organized by Equestricon, highlighted by its second-annual racing convention, festival and trade show on Monday, October 29 and Tuesday, October 30, 2018. Coinciding with the launch of tickets today, Equestricon has released a preliminary schedule of events for the convention. 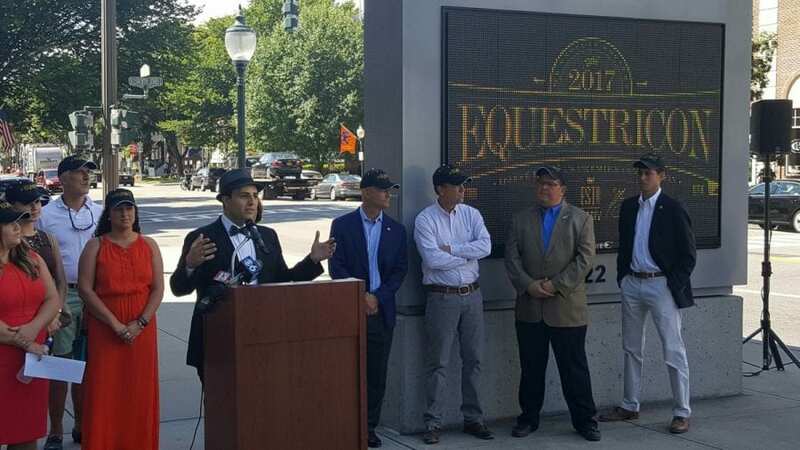 Equestricon 2018 will be held at the newly-renovated Kentucky International Convention Center(KICC) in Louisville. Fans will have unprecedented access to racing’s stars at Equestricon, with expected appearances from the sport’s top jockeys, trainers, owners and farms. With a basic $10 Trade Show Only Pass, attendees will be able to enjoy interactive exhibits and directly connect with more than 100 racing organizations and products in a one-of-a-kind trade show. Premium tickets to Equestricon start at the low price of $65 and offer wide-ranging access to the full convention program, which is now browsable at equestricon.com. Convention-goers holding a $65 Two-Day All-Access Convention Pass can expect dozens of panels, workshops, seminars and discussions on topics highlighting horses, handicapping, photography, ownership, breeding, aftercare and more. Anyone who purchases a Two-Day Pass or ticket of greater value by May 7 will also gain access to an exclusive pre-sale to buy Breeders’ Cup tickets. Equestricon organizers have also announced a series of off-site events and experiences. Some of the featured off-site events include select farm tours (tickets not yet available), a millinery workshop, and racetrack hospitality with guest handicappers at Churchill Downs. Following the convention on Tuesday, October 30, Equestricon will host its “EQConcert” and VIP reception at the Mercury Ballroom in Downtown Louisville. Guests interested in more exclusive experiences and events during Breeders’ Cup week can also purchase the VIP Experience Pass ($360) or the newly-announced Breeders’ Cup Festival Insider Pass, which is exclusively sold by Equestricon.